U.S. craftwork is $13 billion industry and crafts artisans now average $76,000 in annual sales. 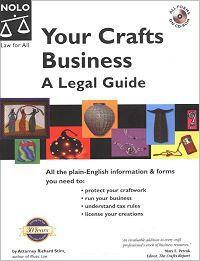 As the crafts business has increased, so have the legal and business problems. Fortunately, you now have a guide to help wind your way through the maze of legal and business rules. Your Crafts Business clearly explains legal principles that protect a crafts business and help it grow. It also provides practical advice on how to deal with day-to-day problems - such as dealing with delinquent payments. The book provides over a dozen tear-out contracts and other legal forms, plus step-by-step instructions to fill them out. If you're a crafts artists concerned about issues such as sales disputes, consignment, design thievery, tax disputes, studio leases, workspace safety and employer liability, then this is the book for you. It's my attempt to provide a real-world view of running a small crafts business and to offer tips for steering your business on a "no problems" course. I've tried to incorporate the experiences of various crafts artists as well as my own experience working with crafts clients. Determine the form of your crafts business. Secure your workspace and negotiating your studio lease. Sell your work, whether consignment, retail, wholesale or commissioned sales. Go online including choosing a domain name, setting up a shopping cart and choosing a web host. Work with employees and contractors. Register and protect trademarks and business names. Register and protect your work with design patents. Register your copyright and avoid copyright problems. License your crafts (including a sample agreement and analysis). Deal with sales reps (and a model sales rep agreement). Avoid liability and legal problems including finding a lawyer, examining your insurance options and resolving contract disputes and rip-offs. Calculate and pay income taxes. In addition to this information, you'll find a dozen agreements and sample letters that you can modify on the CD-Rom attached at the back of this book. Your Crafts Business reader E. Mattingly from Illinois says,"This book is gold. I have bought several books trying to get a clear and concise handle on what is involved in making my business legal. They all bogged me down with things I didn't understand or was left with more questions. Until this book. Richard Stim starts right off with no bull. He states in layman terms what decisions need to made first and moves right on down the line. He gives clear examples of do's and don'ts and always gives references online for further exploration. He also suggests, when necessary, to check with an attorney and what legal forms you can do yourself and what forms can be adjusted. This book comes with a CD of legal forms, so there is no hunting them or tracking down the right offices at the court house. Richard Stim takes a lot of the mystery away and makes you feel confident. I highly recommend this book for anyone!"